Bojan Bogdanovic matched a season high with 29 points to help the Indiana Pacers hang on for a 92-89 victory against the Milwaukee Bucks on Monday night in Indianapolis. 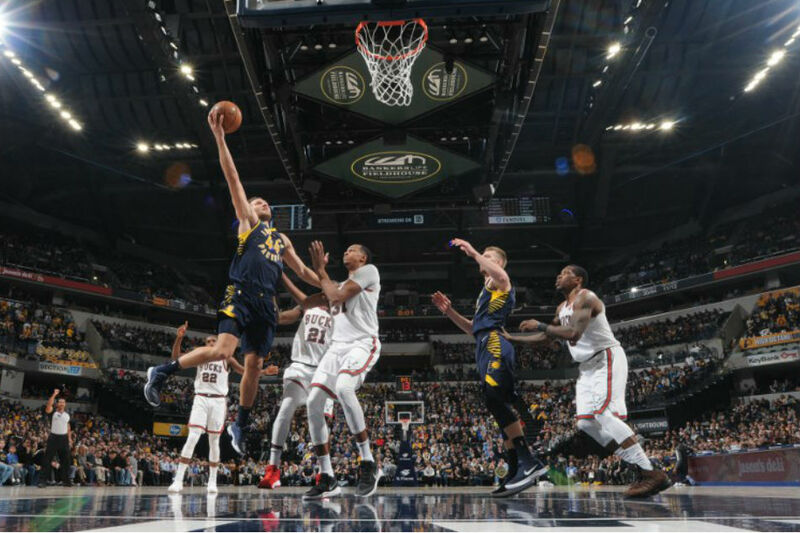 Victor Oladpio added 14 points, both Lance Stephenson and Domantas Sabonis had 11 and Thaddeus Young totaled 10 and seven rebounds as the Pacers won for the third straight game and the seventh time in nine contests. Eric Bledsoe scored 26 points and Giannis Antetokounmpo had 18 with 12 rebounds for Milwaukee, which fell back to the loss column after Sunday's come-from-behind win against Philadelphia snapped a season-high-tying four-game skid. Indiana took two of its first three meetings with Milwaukee this season, including a 103-96 victory on the road Friday. Victor Oladipo had 21 points to lead the Pacers in that contest while Khris Middleton scored a game-high 30. Middleton started Monday despite being a game-time decision with right knee soreness. He finished with six points on 1-of-7 shooting in 34 minutes. Jabari Parker added 15 points. The Pacers were again without Darren Collison, who missed his 10th straight game while rehabbing from the arthroscopic left knee surgery he had on Feb. 6. Indiana led 88-80 with 6:17 remaining before Milwaukee's 9-2 surge had it within a point going into the final minute. Cory Joseph's running layup with 4:07 to play gave the Pacers a 90-84 edge before their offense went cold. Antetokounmpo missed a go-ahead, turnaround jumper with 31.5 seconds on the clock, and Bogdanovic came down with a jump ball between Joseph and Middleton and was fouled by Bledsoe with 5.1 ticks to go. Bogdanovic made both free throws, and Antetokounmpo missed a potential tying 3-pointer at the buzzer. Bogdanovic's 3 with 5:25 to play in the third period gave the Pacers a 65-50 cushion, but the Bucks responded with a 19-8 run to draw within 73-69 entering the fourth. Milwaukee led 46-44 at halftime. Before tip-off, Trevor Booker officially joined the Pacers and was on the court for pregame warm-ups after signing with the team Saturday. The eighth-year veteran forward is expected to make his Indiana debut on Wednesday. "I factored in everything and I thought I could come to this team and bring something positive," Booker told reporters before the game, adding that he had considered offers from other teams. Milwaukee returns home for two games starting Wednesday against Houston. Indiana continues its three-game homestand Wednesday versus Utah.